Whether you're painting plywood walls, shelves, a shed, etc, you do have some good choices when it comes to plywood paint. Prep is key. Painting plywood floors? Special paint, with some cool stencil ideas, are at the bottom (along with some very cool plywood tricks like iron-on glue banding, etc). 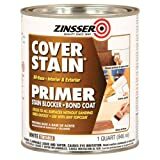 The one thing you’ll definitely need for painting new plywood is the proper plywood primer and this one is excellent: don’t use just any primer. We explain below about raising-the-grain*. Which Paint? Five good choices. So many paints… so little time. A typical shelf or plywood project is done with semi-gloss (like other woodwork). The best way to paint plywood is simply a quality primer and to use the best paint for plywood that you can afford. 4. There is no better semi-gloss white on the market than INSL-X (Benjamin Moore's) Cabinet Coat. 3. Kilz Over Armor fills cracks and evens out to hide imperfections. Three colors, Chocolate, mmm, chocolate, Slate, and Redwood. 2. Only in Metallic Gray, semi-gloss, comes Rust-Oleum Steel-tech. Said to be tough as steel. Hmm. We have never tried it. Let us know. 1. 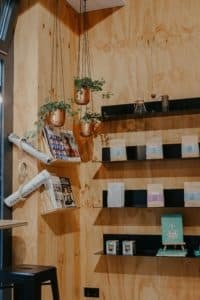 A modern idea used for painting plywood shelves, furniture, etc., is Chalk paint which dries very smooth and flat (for chalkboards), but then is covered by a clear satin or gloss Polyurethane. Looks like a spray job. Sixteen colors. Oil-based paints are a world of hurt but look great. This is an awesome, tough white gloss from Benjamin Moore. Wear the same respirator we wear (the filters are shown on this page). *You can get a very smooth latex finish by adding Floetrol to water-based paint. It slows the drying time allowing brushstrokes to flatten out. If you’re painting plywood that will be outside, as in a shed, go with after using the oil primer above. Tip: Vacuum the floors all around the project (this keeps dust from flying into your paint.) What would I do without my shop-vac? Big tip: With a damp rag, wipe what you’ll paint very well. Small dust will be noticeable. What to filler use? For furniture/shelves etc, use Plastic Wood. Hard to sand, but dries, umm, hard. For floors, see the bottom of this post on floors. Apply with a knife wider than the biggest hole. For walls, a low-cost drywall compound will be fine. For furniture, shelves etc, you need Plastic Wood. Note: thick patches may shrink, so let dry and if needed, just top them off. Furniture-grade plywood is great (at $70+ per sheet), but if you bought the $40 stuff, elbow grease will bring it up a level. We’d recommend getting at least medium-grade for not even a fist full of dollars, Clint. 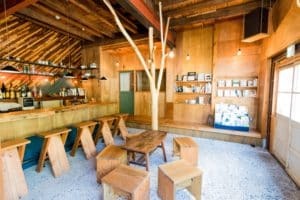 Why do higher grade plywoods cost so much more? Because sanding plywood takes time and money. 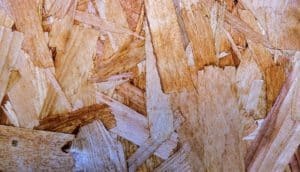 Can you turn medium grade into furniture grade plywood? Yes. Fill the gaps and sand baby, sand. ♦ Sand the entire surfaces at the same time you sand the dried hole-filler. With what? Start off with 100 (medium-rough) then go finer and finer (higher numbers) up to 220 for very fine cabinet level work. ♦ Clean the dust off with your shop vac or a barely damp rag (or use rubbing, a.k.a. denatured alcohol-soaked rag). You don’t want it water—wet ever. 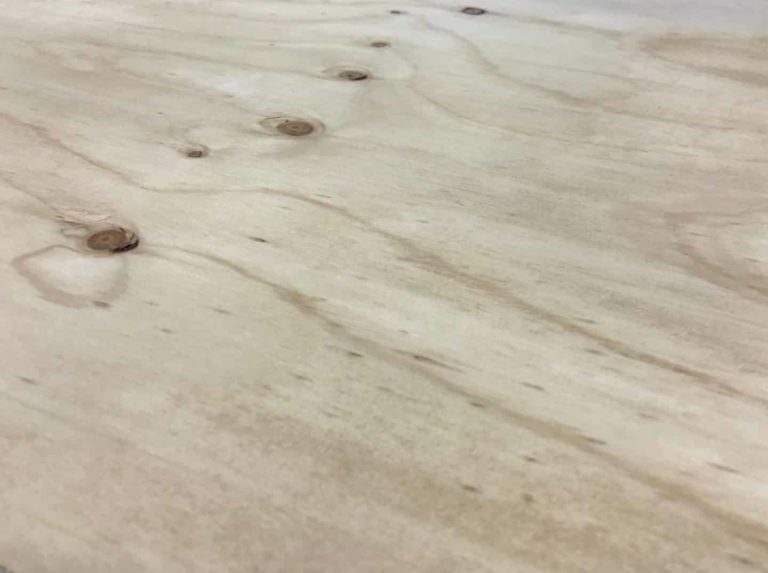 Plywood primer of some kind is a must: plywood is a composite with all kinds of wood knots and glues and resins and you have to seal them or they will bleed through into your top coat. It also creates bonding between wood and top coat. 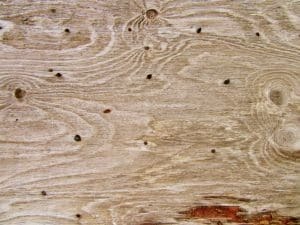 Ever see wood with paint chipping off? Bad primer. We don’t really recommend paint and primer in one “as seen on TV”. There are times it is useful, but not here. Some disagree. 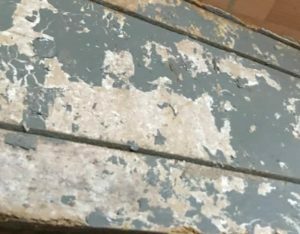 Read this forum about the danger of screwing it all up with paint-primer-in-one. Check for sags, runs, errors, and any men left on base. Depending on drying time, these errors can develop after you think you are done. Dry drips? Just shave them with a razor and try lightly sanding (sanding latex is almost impossible). Did you miss our choices for the best paint for plywood? The best semi-gloss white is INSL-X (Benjamin Moore's) Cabinet Coat. How do painters go so fast? A roller to spread the paint (makes a very even coat), then “tip it out” paint with a good brush. Your lifetime brush and roller are under “Shopping List“ below.♦ Don’t go low-budget on the brush or roller as they fall apart when wet. There outta be law. Between coats, inspect. Do you see any holes you forgot to fill or that shrank? Just hit them again, let dry, sand and then prime/paint to catch them up. Read the paint can label on re-coating time. There is a minimum and a maximum. If you wait too long, you have to sand between coats. Walls? Painting plywood walls are the same as painting any walls after the prep is done. Choose the thicker nap when you get your painting roller cover: about 1 inch. People will not know you have painted plywood walls. 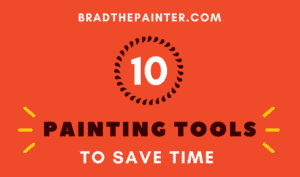 You may be able to save time and paint by tinting your primer. Careful: too much tint reduces the ability of the primer to do the job you are paying for. Aim for a light gray in most cases: by adding black tint. Almost all colors cover gray amazingly well. You might not need a 3rd coat (2nd top-coat). Ka-ching. Paint will not fill tiny cracks, but adding Floetrol for water-based paints or Penetrol for oil-based paints helps the paint to “flow,” smoothing out the “grain” plus brush marks totally disappear. The thicker Kilz Over Armor is good for this too. Those websites telling you to ‘brush with the grain’ or ‘brush against the grain’)? Bunk. Does not matter at all. Primer is key: do it well. That’s it. Clean your brush: wire brush the dried crud (handle too) and pound the heck out of the bristles under warm water until 98% clean (more details: 5-minute read). Comb straight to dry: it will be line new next time. Easy. (Video demonstration). For the roller: massage it under a faucet until mostly clean, then soak in a bucket overnight: the rest of the paint will settle to the bottom. (details: 5 minute read). We use ‘spinners’ (see video). Quality tools are hard to kill. A Purdy latex brush lasts us 6 months of daily use: all friggin’ day. Plywood caution: Ask the store if the wood is from China: there is a lot of junk going around (the layers come apart). Building something? The best way to paint plywood: do it before cutting it. Then just touch-up the edges where you cut: this saves a lot of time. All you ever need to know about plywood (every type of composite) is on Wikipedia, Lord of the Internet. Here is a great video all about the types and uses of plywood and composites. Spray painting plywood is probably the best way to go if you have a lot: here is a post on 3 sprayers for 3 budgets. Time out: A plywood guitar? 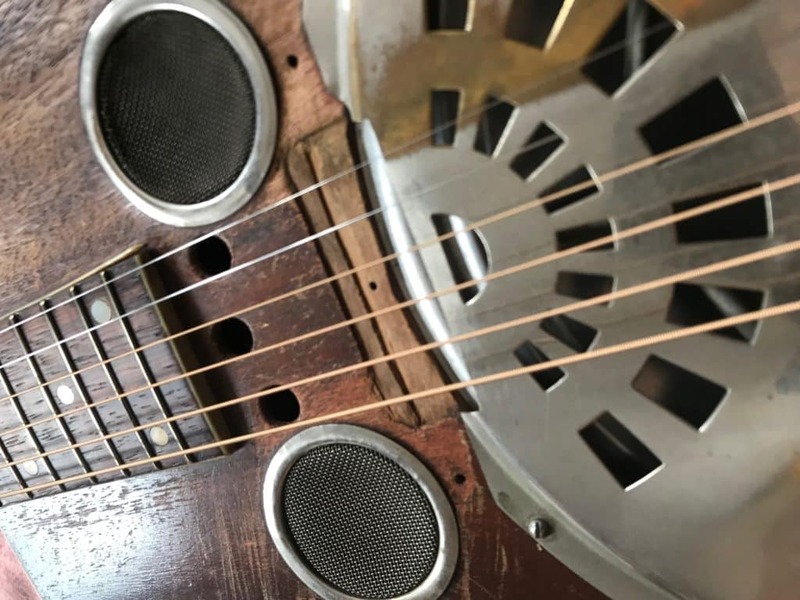 Yes, a very expensive plywood guitar: a 1929 or 1930 Dobro. Owned by Robert Johnson! Not. See the very bottom. Nowhere will you find any floor covering for less than a dollar per square foot except for painting plywood floors. We priced the cost (including tools, see our list here), at about 50¢/sq.ft. Wow. Clearly attractive. Laminate ‘click flooring’ is 4x to 16x as much. There are two basic choices: Benjamin Moore's INSL-X non-slip for under $50, and a decent Kilz product for about $10 less. You need to like gray. White? Valspar is a good choice. In two ‘shades of gray’. Painting a floor is the easiest thing we do as professional painters. Cha-ching, the money maker. We have a post just on painting floors (it’s not just for basements), that discusses how/when to move furniture, etc. Be glad and read about how filthy carpet can get. Note: Plywood is softer than other floor coverings, so you’ll get some dings….easy to fix and touch up as well if you like, but most dings will disappear in a floor stencil pattern. Remove or sink any nails/screws and fill with Goodfellas. Don’t use floor leveler! It cannot be sanded. Plan it out: move furniture, paint in sections. Read the post on protecting fresh floor paint. 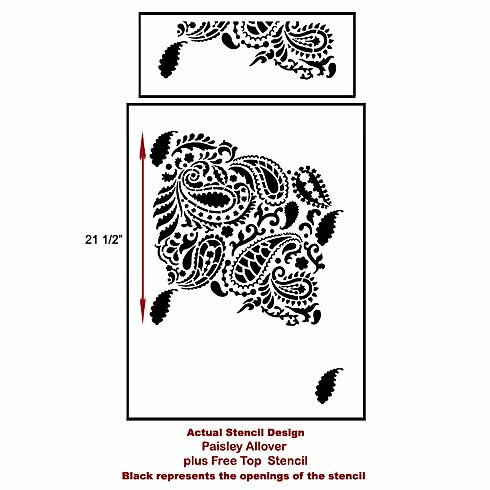 Paisley Allover is a nice pattern to start your search with. 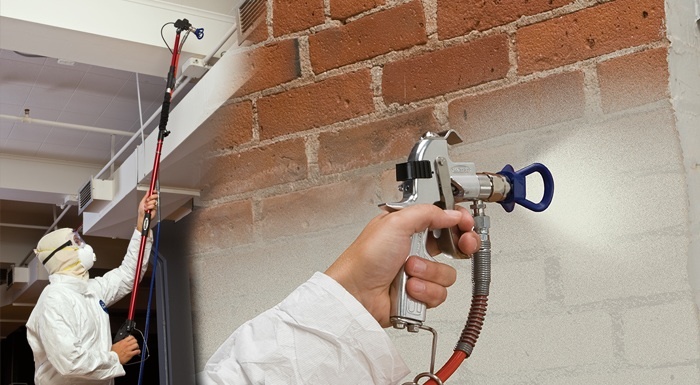 Key tip: this requires one coat (only) over your painted plywood floor. Stencils come with full instructions (videos too, duh). Bigger stencils will make your work faster. A mini roller with a thin foam nap may be the best application method for DIY’ers. For 9 inch rollers, get a good one from Wooster: not expensive. Clean and keep! Simply lay the stencil in place, secure with painter’s tape, then paint your accent color. 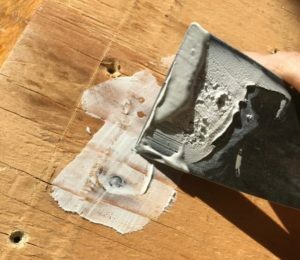 Use green painter's tape (only) to hold in place while painting. (It has special glue that will not pull off recently applied paint). Lightly roll or brush your roller over your stencil. Clean the stencil after each square: don’t let the paint dry on it and you’ll keep the lines sharp. Tip: Clean the stencil after painting over it with each section: you will need a water basin and old towels. Keeping it clean makes for sharp lines. Bold choices might sound good, but looks sort of ’70s. Go neutral, earthy. The bottom color is the background. If the stencil color skips etc, you can touch up with an artist’s brush. Most floor paint is some gray etc. I used colors suggested by these architects. They say gray goes with black, rose, green mint, cherry, sunny yellow, aqua and more. We did black over gray. Nice. Banding: the illusion of wood. Banding with easy to apply with an iron. See my video below for how to make paintable plywood edging for almost no cost. ♦ We use a Purdy brush will last a lifetime. ♦ A Wooster roller frame (a.k.a roller cage). ♦ The wool/poly blended roller cover. Choose the ½ nap for painting plywood. Budget rollers shed lint! Tip: Bristles fall right out of ‘budget’ brushes and lint out of rollers. Get my tools and you won’t spend much more than you would for those all-in-one kits with the crappy brush and pan etc. 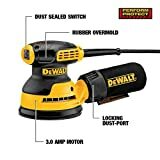 The full tool list: all you will ever need. Quality tools: easy to clean up. Make them last a lifetime. A variety of sandpaper, and if you’re doing a lot, you’ll love having your palm sander. At publication time, this was well under fifty dollars: wow. Good price. I’m grabbing one too. Does not require special paper.Whoever thought up sanders that need special paper? Daft. Everything you need to know is below in ‘how to paint plywood’. What we recommend as a plywood primer will not raise the grain of the wood*. There is also an odorless option. Plastic Wood dries very hard, and for gaps between plywood sheets. For floors you really want the gaps to give (hard stuff cracks), so get the flexible stuff. * All wood has layers of soft/hard/soft grain. Water-based primer makes the soft grains swell more than the hard, and create a bumpy surface. Big time sanding. A world of hurt. Mucho problemo sandingo. Don’t like seeing the rough edges? Try iron-on banding strips: the best carpenters do it. Household iron required. More at the bottom. This is a medium grade plywood, suitable for painting with the proper prep. How Many Coats of Primer for Any Situation? You’ll Like the Answer. Did we forget anything? How to paint plywood ‘XYZ’? We hope we covered it all, but you never know. Let us know in the comments below. A 1929 or 1930 Dobro guitar that my repairman wants to paint. No Way, José. 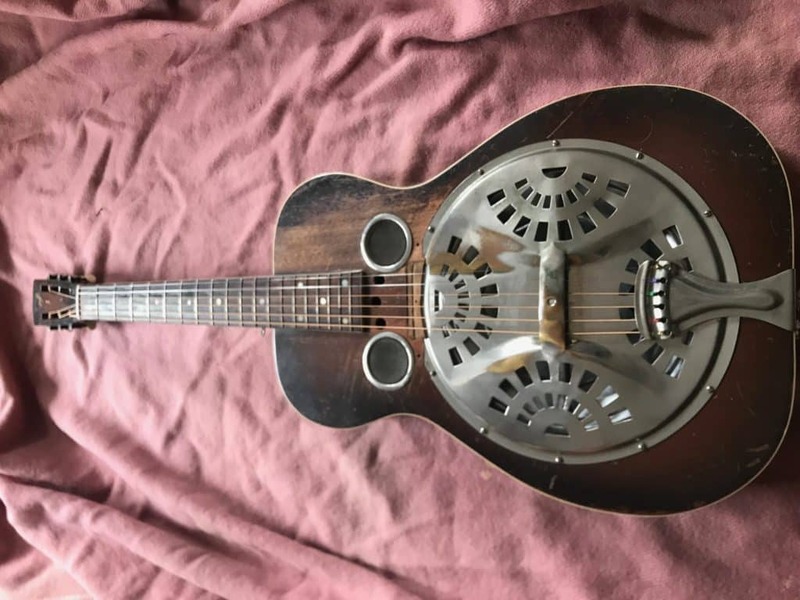 Dobro guitar shows plywood top. If painting, you would have to fill this exposure with wood, not plywood filler.